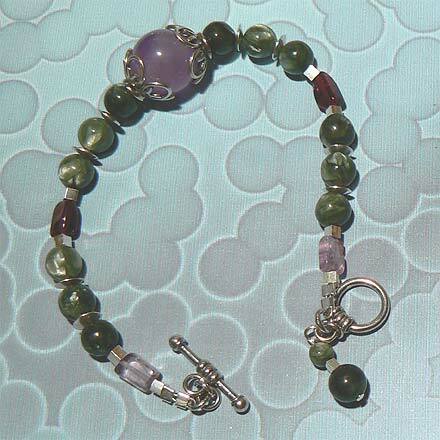 Sterling Silver Seraphinite, Amethyst and Garnet Bracelet. Seraphinite is the most expensive of the semiprecious stones I carry. It comes from Siberia and has both a chatoyant and crystaline appearance. The bracelet is 7.3". For those who are interested in Astrological significances of stones, Amethyst corresponds with Pisces and the month of February. Garnet corresponds with Capricorn and Aquarius and the month of January.